[i am a dekaphobic]: Manang's Chicken: New Menu Items! Manang's Chicken has been one of my favorite lunch spots since it opened last 2011. Though I mentioned before that I'll give their other dishes a try, I wasn't able to do so. Their chicken is just too irresistible! Good thing I was invited by Manang's Chicken to try the latest additions to their menu. My friend and I first had my favorite, Manang's Chips & Dips (Php 64 for large). The large one includes 2 dips. Available dips are Garlic Mayo, Creamy Cheese and their newest flavor, Spicy Ketchup. I like how the taste of Spicy Ketchup goes well with the chips. We also had Coleslaw (Php 29) and Buttered Corn (Php 29). Also available is the Macaroni Salad (Php 29). For Rice Meals, we tried the Garlic Pork Rice Meal (Php 109 with drinks). It is deep fried pork chop topped with special garlic topping, served with a vinegar dipping sauce. I seriously haven't noticed this before, as I always order chicken. The pork chop is quite huge, combined with the Upsized Rice serving (50% more), it's really worth the price. For dessert, we had their newest dessert, the Red Velvet Sundae (Php 49). It's a layer of red velvet cake with vanilla ice cream on top with candy sprinkles. I honestly like this better than the Velvet Sundae. It has chocolate syrup inside the red velvet cake, which I really loved. This dessert is only available this February, but I do hope they'll keep this on their menu permanently. 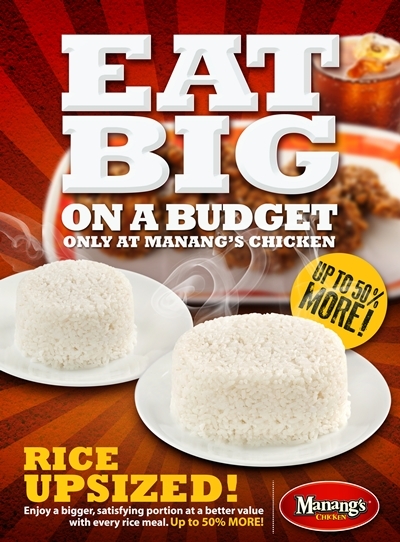 Manang's Chicken continually strives to serve Filipino-inspired dishes on affordable prices. As a customer, I could honestly say that the their chicken is always of excellent quality. I'm crazy about the ultimate chicken sandwich!!!! Haha give it a try if you haven't yet! how was the garlic? i am fan of garlic but that's too much.